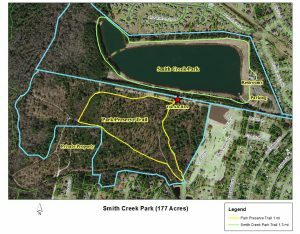 The Smith Creek Park Preserve is a natural area located adjacent to Smith Creek Park. The preserve nature trail can be accessed from the park’s paved walking trail (red star on the map). 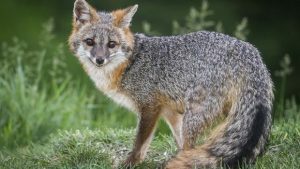 The preserve is a natural habitat for many species of birds, mammals, reptiles and native plants. Learn more about them below! The bowl and doily spider is a species of spider found in North and Central America. It is a small spider that weaves a unique web system consisting of an inverted bowl-shaped web suspended above a horizontal sheet web (the “doily”). 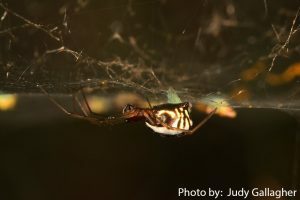 The spider hangs from the underside of the “bowl” and traps small insects. 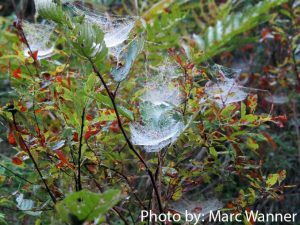 The webs are commonly seen in weedy fields and in shrubs May through October. 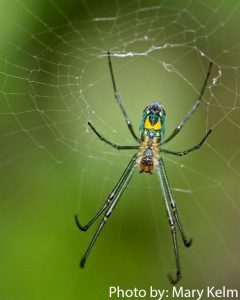 The orchard orbweaver is a spider that ranges along the east coast of southern Canada to northern South America, reaching into the central US. The spider is usually seen hanging down in the center of its horizontal web. It is brightly colored, having green legs and sides. It has noticeable silver and yellow markings on its abdomen, and often has neon orange or red markings underneath. Commonly mistaken for spiders, daddy-longlegs are relatives of spiders that make their living by eating decomposing vegetative and animal matter. They are also called harvestmen. 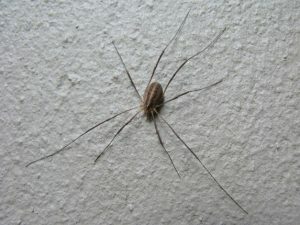 Unlike spiders, who have two distinct body segments and eight eyes, daddy-longlegs have two body segments fused into one and at most two eyes. 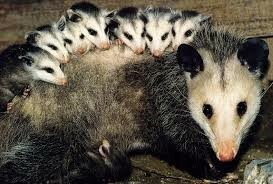 They are usually found under logs and rocks, prefer moist habitat, and have eight long flexible legs. They do not produce silk or make webs, and they do not have venom glands or fangs. Ticks are small, slow, teardrop-shaped arachnids. 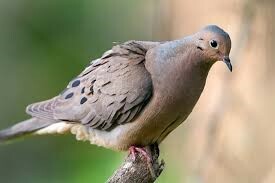 They can be flat or round, depending on when they last fed, and they do not fly or jump. 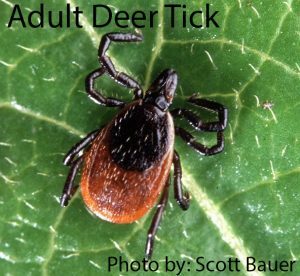 Ticks feed on blood and are often not spotted until they are attached to their host. 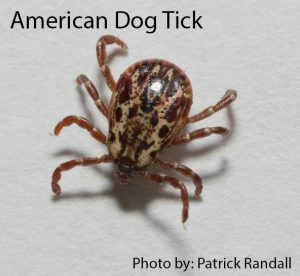 There are hundreds of species of ticks but few species pose any threat to humans and domestic animals. 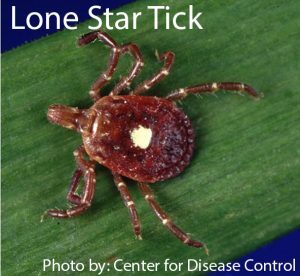 The deer tick, American dog tick, and lone star tick are some that can transmit disease from one host to the other, and they are all found in this region. Most tick bites are harmless, but if a rash appears near the tick bite or you experience any unusual symptoms please see a doctor as soon as possible. Check yourself for ticks after you spend time outside. If you find a tick attached to you, use tweezers to remove it- grab the tick with tweezers as close to the skin as you can, and gently pull the tick out. Be careful not to twist or crush the tick. Freeze the tick in a plastic bag in case you need to identify it later, and wash the tick bite with soap and water. 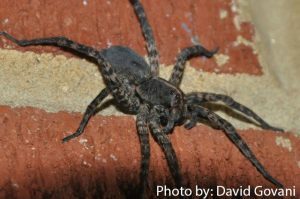 The Carolina wolf spider is the largest type of wolf spider in North America. They vary in pattern and color, from light brown to dark gray. The Carolina wolf spider can be found throughout the United States into Canada and Mexico. Wolf spiders live in small silk-lined burrows as opposed to living in webs and are nocturnal predators. They will run down their prey instead of trapping them in a web. 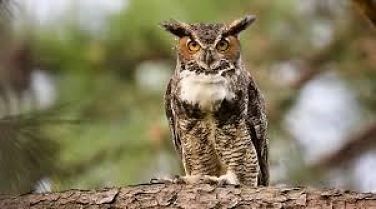 You can find them at night by shining a flashlight into the grass, their eyes are very reflective and will shine right back at you. 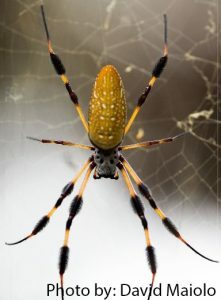 The golden silk orbweaver, also known as the banana spider, can be found in the southeast United States and all the way down into South America. The live in forest areas along trails. Their high webs help them catch flying insects, including beetles and dragonflies. 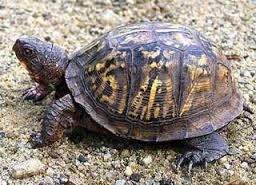 The females are 5 to 6 times larger than males and are about 3 inches long on average. Females are mostly yellow with a long abdomen and tufts of hair on their legs. The males are only about 6 mm long and are only noticeable because they are often found on the webs of females. Also called the yellow argiope or the writing spider, the yellow garden spider looks very similar to the golden silk orbweaver. Both species have larger females with yellow on their abdomen. 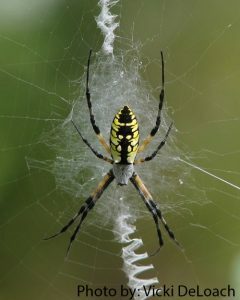 The yellow garden spider female, however, has more of an egg-shaped abdomen that is mainly black with yellow markings. They do not have tufts of hair on their legs like the golden silk orbweavers. 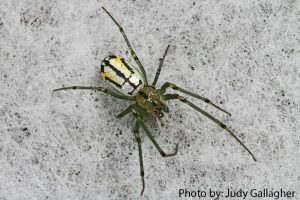 The yellow garden spiders often add stabilimenta, or heavy zig-zagging portions in their webs that make them easy to identify. The black widow is one of the most venomous spiders in North America, although their bite is rarely fatal to humans. The females are more distinctive than males. They are close to half an inch to one-inch-long, are shiny black, and have a very round abdomen with a red hourglass shape underneath. 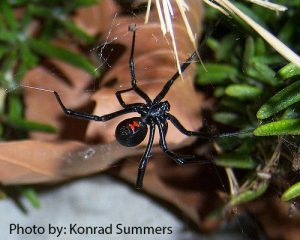 After they mate, the females tend to eat the males, hence the name “Black Widow”. Pain from a black widow bite usually lasts 8-12 hours, but they are not aggressive and only bite humans when disturbed. They are typically found in dark, dry areas of shelter. There are many different species of spinybacked orbweaver, all of which have a hard, broad abdomen similar to a crab shell. They are often brightly colored. In this species, Gasteracantha cancriformis, females are larger with small spines on their abdomen, while males tend to be smaller and do not have spine. Like all orbweavers, their web is circular in shape. 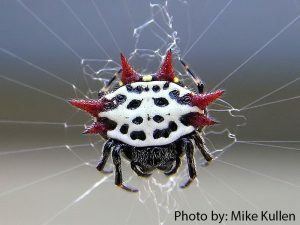 The spinybacked orbweaver adds extra tufts of silk to its web, which are thought to serve as warning flags to birds so that they don’t fly into the web and destroy it. 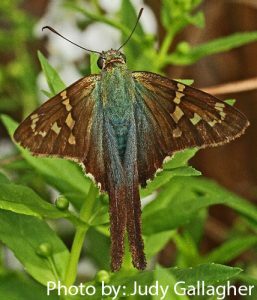 The silver-spotted skipper is one of our largest and most recognizable skippers. This skipper can be found throughout most of the United States and into southern Canada. 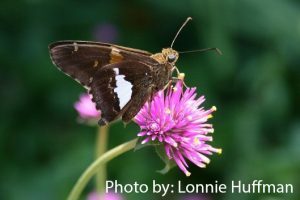 Skippers tend to look like small brown moths that are active during the day, but luckily the silver-spotted skipper has a large white spot on the underside of each hind wing to help identify it. The upper-side of the wings is brown with a few gold spots. These skippers have a short, rounded tail. 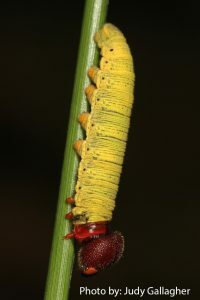 The larvae can grow up to two inches long and are mainly yellow with a reddish brown head. During this stage they live in leaf shelters to protect them from predators. 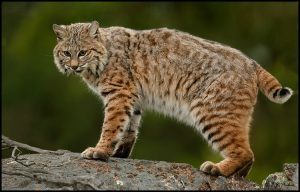 As they grow, they feed on the leaves of plants in the pea family (Fabaceae) and a variety of other legumes. Silver-spotted skippers, as well as other species of skippers, have a jerky, somewhat erratic flight pattern. They are found on the edges of forests, brushy areas, and open areas like Smith Creek where nectar plants are found. This is a hidden gem of the pollinator garden! Like other skippers, they may seem like small, dull insects flitting around, but just wait until they land. Their long tails and beautiful blue coloration on the upper-side of the wings makes them a delight. 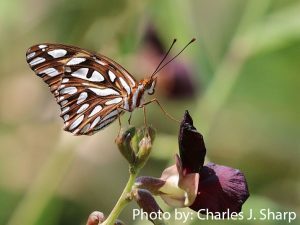 They are found in much of the eastern and southern United States, and like the Silver-Spotted Skipper, their larvae feed on host plants in the legume family. 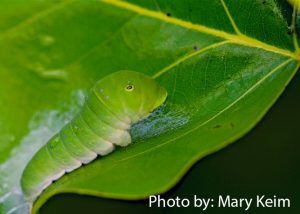 As larvae they are also leaf-rollers, meaning that they use their silk to wrap leaves around themselves as they eat. The larvae are green with yellow stripes, turning orange on the back end. A common native moth seen throughout the United States and southern Canada. 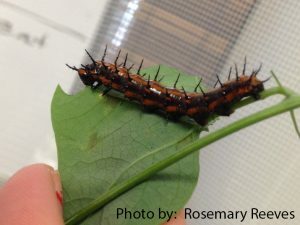 These caterpillars, which vary in color, feed in colonies on foliage of hardwood trees and spin webs around leaves in the process. After making their cocoon, they will become a small hairy white moth. These webs are located at the outer ends of branches, as opposed to the eastern tent caterpillar, who make their webs where two branches join together. 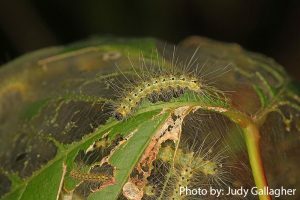 In the Southeast, fall webworms are active April-October and preferred host plants are hardwood species of forest, shade, and fruit trees. The webworm is capable of defoliating and causing damage to trees, but natural enemies like disease and predators help keep their populations in check. 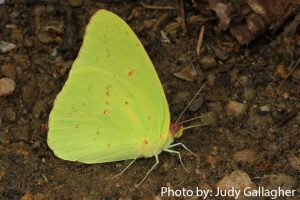 A bright yellow butterfly that can be seen throughout the summer, especially in open areas like parks, yards, gardens and beaches. 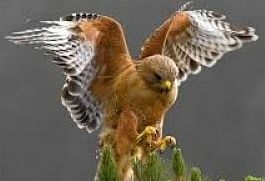 They are fairly large, with a wingspan of two to three inches. 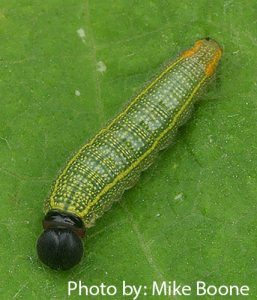 The caterpillars are green with yellow stripes down the side, and they use various species in the pea family as host plants. Cloudless sulphurs drink nectar from various flowering plants, although red flowers are preferred. These butterflies are very noticeable in August-October, when they are migrating through to Florida where they will spend the winter until it warms up in the spring. 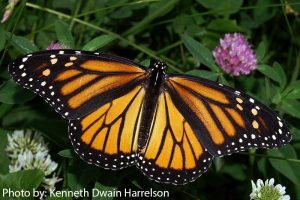 The monarch butterfly is easily recognized by its distinct orange and black wings. The monarch lives throughout North America. Millions of monarchs that live east of the Rocky Mountains are well known for their migration to Mexico in the fall, where they roost over the winter. 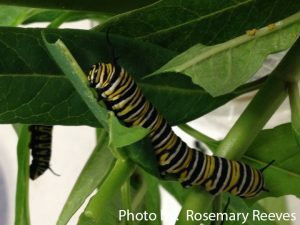 Monarchs only lay their eggs on milkweed, and the larvae only eat milkweed, making this plant extremely important to the survival of the species. The monarch larvae that eat milkweed are brightly colored, with black, white and yellow horizontal stripes all the way down their body. This is thought to be a warning sign to predators that lets them know not to eat monarchs. 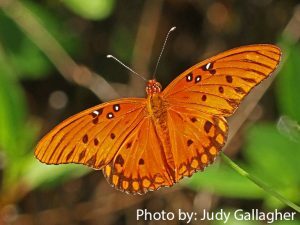 The gulf fritillary is a medium-sized butterfly with elongated forewings. The upper-side of the wings is bright orange with black spots and markings. The undersides of the wings are brown with long silvery-white spots. At home in open and sunny areas, it is a regular in most butterfly gardens, including gardens in more urban settings. 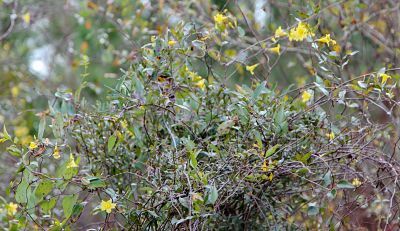 Females lay the small yellow eggs singly on leaves of the passionflower vine, especially purple passionflower. The larvae are bright orange/red with numerous black spines. These spines are not dangerous and serve to scare off any predators. 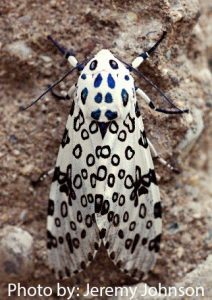 The giant leopard moth is found from southern Canada throughout the eastern United States. The eggs are small, pearly gray spheres and hatch into what many people call a wooly bear caterpillar. The body of the caterpillar can be orange to dark brown and is covered with stiff black, bristly hairs. The hairs do not sting and are not venomous. When threatened, the caterpillar curls up into a tight ball and the stiff spines help to deter predators from trying to eat them. Full-grown giant woolly bear caterpillars are about three inches in length. The caterpillar eats a wide variety of plants, such as dandelion, plantain, violets, cherry, and honeysuckle. Because it is a moth, the pupae are enclosed in thin, web-like cocoons instead of a chrysalis. The adult is a beautiful large moth with white scales adorned with black circles, bars, and dots. Adults can secrete a drop of liquid when threatened that is bitter tasting for any predators. 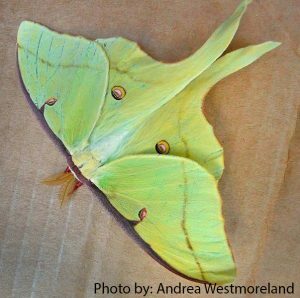 One of the most well-known moths in our area, the luna moth gets its name from its moon-like spots on its yellow-green wings. They are also one of the largest moths we have, with a wingspan of four and a half inches! 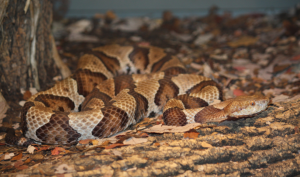 In the United States, it is found in every eastern state from Maine south to Florida and west to eastern Texas. The bright green caterpillars hatch out of mottled brown and white eggs. The hungry caterpillar then fills up on walnut, hickory, sweet gum, and paper birch tree leaves. When it is ready to make its cocoon, it wanders off the plant and spins a cocoon wrapped in leaves. These beautiful moths do not have a fully developed digestive system or mouth when they emerge from their cocoon and cannot feed. Because of this, they only live for about one week once they are out of their cocoon. 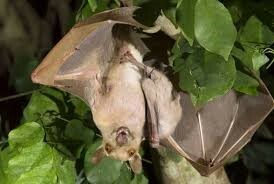 To protect themselves from predators, especially bats, the moths spin their “tails” in circles. This is disorienting to predators and the moths are able to get away. 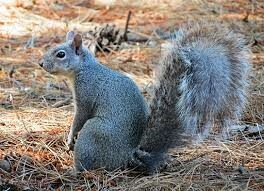 Their numbers fluctuate from year to year, and outbreaks occur every several years in late spring and early summer. Eastern tent caterpillar nests are commonly found on wild cherry, apple, and crabapple, but can be found on other native trees as well. During an outbreak, tent caterpillars can eat all the leaves off of a tree, but if it is a healthy tree it will usually recover. 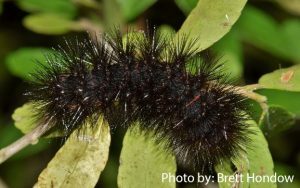 These hairy caterpillars are black with a white stripe down the back and usually have a row of blue spots on the sides. Caterpillars hatch out of an egg mass, and will spin a silk tent or nest in the crotch of a tree. They can be up to two and a half inches long when full grown, at which point the caterpillar will wander away from the nest to spin its cocoon. 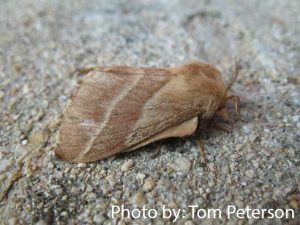 Adults (1-1/2 inches long) are reddish brown moths with two white bands running diagonally across each forewing. Eastern tent caterpillar nests and fall webworm nests look very similar. 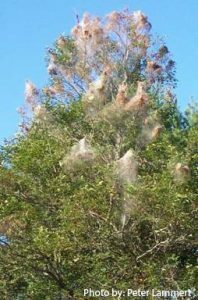 The location of the nest helps tell them apart- fall webworm nests are located at the ends of the branches and their loosely woven webs enclose foliage while the nests of the eastern tent caterpillar are in the crotches of the tree and do not enclose foliage. 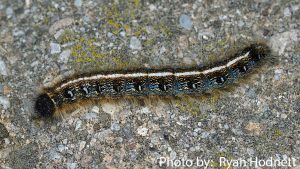 Like the fall webworm, natural predators and disease help to regulate the population of tent caterpillars. 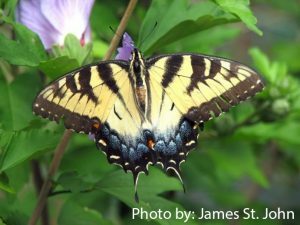 Found in eastern North America, the Eastern tiger swallowtail butterfly is one of the most striking and recognizable butterflies in our area. With a wing span of up to four and a half inches, it is also one of the largest North American butterflies. They are yellow with dark tiger stripes, and the bottom edges of the hindwing have colorful blue scales and several orange spots. Males tend to have less blue scales and orange spots than females. There is a dark morph of this butterfly as well, meaning the butterfly is all black instead of yellow with stripes, although the blue scales and orange spots are still visible. Females lay eggs on a variety of host plants, including plants in the magnolia and rose families. Other host plants include the tulip tree, birch, ash, and wild black cherry. Young caterpillars resemble bird droppings to confuse predators and avoid being eaten. 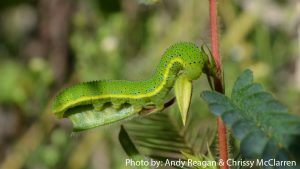 As they mature, they turn bright green and have two huge black and yellow false eyespots, right above their true eyes, which are used to make the caterpillar look bigger than it actually is. The family name Megalopygidae and genus name Megalopyge are derived from the Greek roots Megalo (large) and pygidium (rump) – probably because of the shape of the caterpillars. 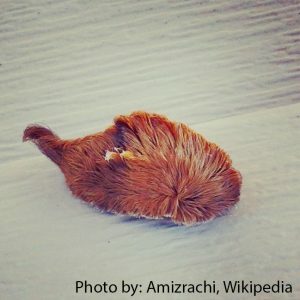 The name “puss caterpillar” is likely in reference to the caterpillar’s resemblance to a cat with its soft fur and tail. While it may look cute and fuzzy, do not pet it! This caterpillar is actually one of the most venomous caterpillars in the United States. It has hollow spines each equipped with a venom glad, and it’s sting can be extremely painful, with pain lasting up to 12 hours. 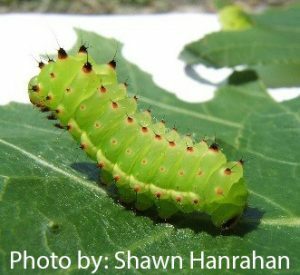 The caterpillars feed on a variety of host plants, oaks and elms being common hosts. 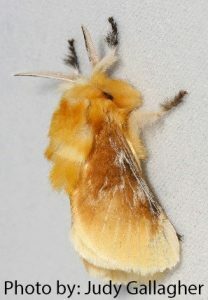 When it emerges from its cocoon, the puss caterpillar is then known as the southern flannel moth. The moths are small yellow moths with white hairy scales on the wings. 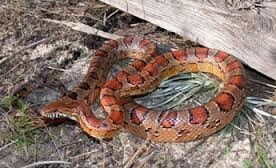 Their bodies are covered in fuzzy looking orange scales. The hairs on the adult moth are not venomous. If you get stung by a puss caterpillar, put tape on the affected area and then rip it off. This helps get any spines stuck in the skin out. Apply an ice pack and seek medical help if the pain becomes unbearable. Bears prefer large expanses of uninhabited woodland or swampland with dense cover. In the east, lowland hardwoods and swamps provide good bear habitat. 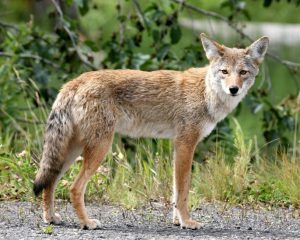 These types of habitat provide the necessary travel corridors, escape cover and natural foods that bears need to thrive. 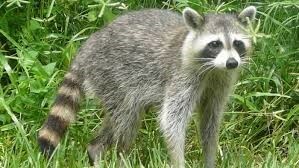 Feeds on a variety of food sources, depending on what is available, including fruit, berries, rodents, rabbits, birds, snakes, frogs, insects, animal remains, roadkill, garbage and pet food left outdoors. Nuts, acorns, seeds, fruits, mushrooms, tree buds and blooms. 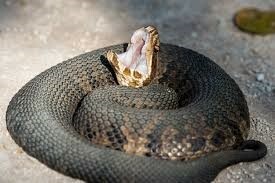 Occasionally they consume insects, bird eggs and young birds. Canada Geese live in habitats near water, grassy fields and grain fields. Canada Geese are particularly drawn to lawns for two reasons: they can digest grass, and when they are feeding with their young, manicured lawns give them a wide, unobstructed view of any approaching predators. 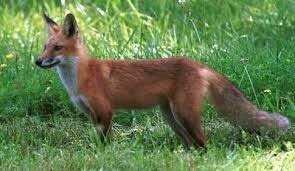 So they are especially abundant in parks, airports, golf courses, and other areas with expansive lawns. Leaves of clover, grasses, cultivated grains. Preferred plants: ladino, alsike, red clovers, barley, wheat, rye, alfalfa, orchard grass, bluegrasses, creeping red and Kentucky fescue. Preferred grains: millets, corn, oats, buckwheat, soybeans. Wooded swamps, beaver ponds, freshwater marshes and along streams and rivers near forests. 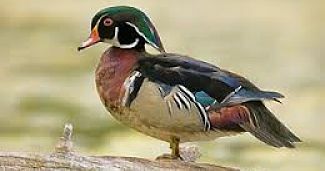 Wood ducks nest in natural cavities, like those found in trees. Candle Making: The wax is extracted by boiling the berries and skimming off the floating hydrocarbons. The fats are then boiled again and strained. After that the liquid is usable in candle making through dipping or molding. 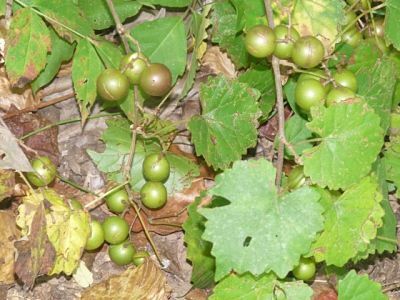 Native Americans used the leaves and stems to brew a tea, commonly thought to be called asi or black drink for male-only purification and unity rituals. Poison ivy rash is contagious. 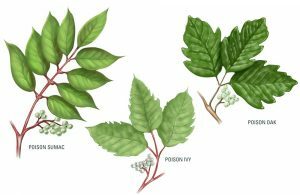 Rubbing the rash won’t spread poison ivy to other parts of your body (or to another person). You spread the rash only if urushiol oil- the sticky, resin-like substance that causes the rash- has been left on your hands. 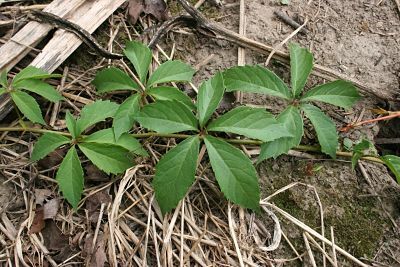 You can catch poison ivy simply by being near the plants. Direct contact with the plants is needed to release urushiol oil. Stay away from forest fires, direct burning, lawnmowers and trimmers when they are being used because they can cause the urushiol oil to become airborne. Leaves of three, let them be. 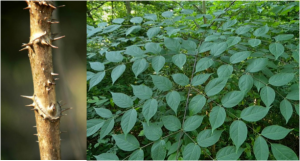 Poison sumac has 7 to 13 leaves on a branch, although poison ivy and oak have 3 leaves per cluster. Do not worry about dead plants. Urushiol oil stays active on any surface, including dead plants, for up to 5 years. Breaking the blisters releases urushiol oil that can spread. Not true. However, wounds can become infected and make the scarring worse. In very extreme cases, excessive fluid may need to be withdrawn by a doctor. The word “loblolly” originally meant a thick porridge or gruel served to English sailors. When Europeans first came to settle the southeastern United States, they used that word to describe some of the local swamps where they found mud with the same thick, gooey consistency. 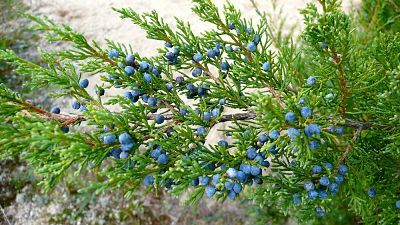 The term also came to be applied to some of the plants that commonly grew in these areas, which is how loblolly pine (Pinus taeda) got its common name. Today loblolly pine, is the most important commercial timber in the southeastern United States. Over 50% of the standing pine in the southeast is loblolly. The specific epithet, taeda, comes from the Latin word for torch and refers to the resinous wood. This is an easily-seeded, fast-growing member of the yellow pine group and is an aggressive invader in fallow fields. 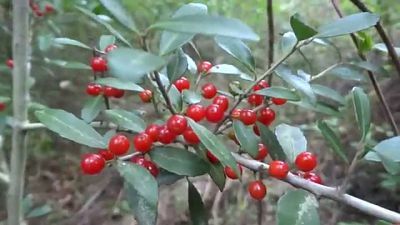 It is widely grown in plantations for commercial timber production, but also has been planted to help stabilize soil and reduce erosion or as a noise and wind barrier. Loblolly has also been planted in mine reclamation areas and due to its high litter and biomass productivity, loblolly pine is being studied as a possible alternative source for energy. Loblolly pine stands are important for numerous wildlife species. 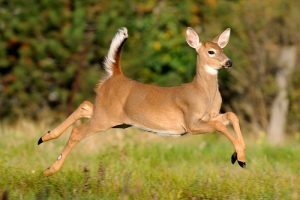 The trees provide habitat for many animals, including white-tailed deer, wild turkey, gray squirrels, rabbit, quail, and doves. Many songbirds feed on the seeds and help propagate the trees through seed dispersal. Red crossbills depend on loblolly pine seeds for up to 50% of their diet. Other birds who frequent the trees include pine warblers, Bachman’s warblers, and brown-headed nuthatches. Osprey and bald eagles often nest in tall loblolly pines. 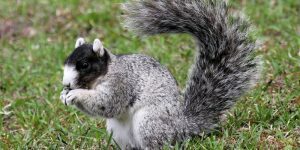 Two endangered species that also use these pines are fox squirrels, which eat the cones, and red-cockaded woodpeckers, which will sometimes nest in old growth trees. 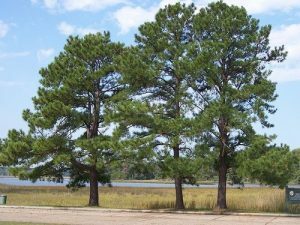 The wood of this tree, which is marketed as southern yellow pine, is of lower quality than that of longleaf or shortleaf pines in terms of lumber and is therefore primarily used for pulp and paper products. However, it is possible for use as lumber or plywood. Longleaf pine forests need forest fires to thrive. Historically, leaf litter and debris were cleared away by forest fires that were sparked during lightning storms. The vegetation associated with longleaf pine reflects the frequency and severity of burning. In the North Carolina Coastal Plains, wiregrass (Aristida stricta) is the most common ground-cover in Longleaf forest When fire is suppressed, ground cover buildup prevents seeds from reaching the soil, and they can’t germinate. Those seeds that are able to take root undergo an interesting life cycle that differs from most other conifers. Rather than spending its first few years growing in height, the longleaf pine goes through a grass stage. From the surface, the grass stage plant appears to be a large clump of needles that grows very little. The real work, however, is going on underground. During the grass stage, the longleaf pine starts to develop its central root, called a taproot, which will be up to 12 feet long at maturity. After going through the grass stage, longleaf pines begin to grow in height. Both mature trees and grass stage specimens are fire resistant. With a reduction in fire occurrence, hardwoods and other pines encroach on the longleaf forest. Longleaf pine is intolerant of competition, whether for light or for moisture and nutrients. Within the range loblolly and shortleaf pines (P. taeda and P. echinata as well as hardwoods gradually replace the longleaf, eventually resulting in Loblolly Pine-Hardwood or occasionally Loblolly Pine-Shortleaf). Hardwoods most closely associated with longleaf pine on mesic Coastal Plain sites include southern red, blackjack, and water oak (Q. nigra); flowering dogwood (Cornus florida); blackgum (Nyssa sylvatica); sweetgum (Liquidambar styraciflua); persimmon (Diospyros virginiana); and sassafras (Sassafras albidum). 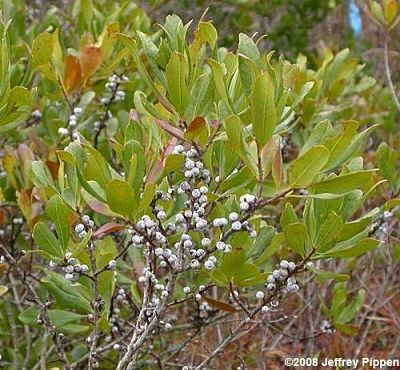 The more common shrubs include inkberry (Ilex glabra), yaupon (I. vomitoria), southern bayberry (Myrica cerifera), shining sumac (Rhus copallina), blueberry (Vaccinium spp. ), and blackberry (Rubus spp.). 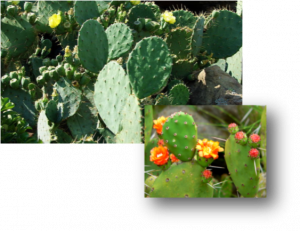 On xeric sandhill sites, the most common associates are turkey, bluejack, blackjack, sand post, and dwarf live oaks (Quercus laevis, Q. incana, Q. marilandica, Q. stellata var. margaretta, and Q. minima). Longleaf pines, which once covered an estimated 90 million acres, now cover less than 3 percent of their original range. This tree was once so abundant that it seemed like an inexhaustible resource to early settlers. Forests of longleaf pine were cleared to make space for development and agriculture. The lumber, which is of exceptional quality, was used for building ships and railroads. Most of the longleaf pines were gone by the 1920s. Rather than replanting the longleaf pines, foresters replaced them with faster-growing pines that would produce more short-term economic benefits. Restoration of longleaf pine forests has become a major conservation priority in recent years, though. 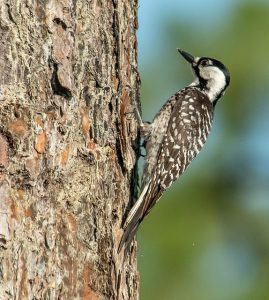 Over 30 endangered and threatened species, including red-cockaded woodpeckers and indigo snakes, rely on longleaf pine for habitat. 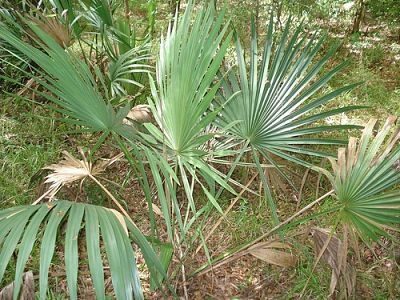 Additionally, longleaf pines are more resilient than other southeastern pines to the negative impacts of climate change. They can withstand severe windstorms, resist pests, tolerate wildfires and drought and capture carbon pollution from the atmosphere.